I knew about this beautiful Dan Kitchener piece, because I’d seen it a couple of times on Instagram, so it was ‘front of mind’ when I eventually made it to Brick Lane. The piece, on a perfect wall was towards the southern end of Brick Lane, and although it has been there since mid-March was in remarkably good nick. It is impossible not to admire Dan Kitchener’s work and his geisha pictures really are sublime. The piece is awash with colour and the hair decorations are so beautifully crafted, the street lights behind creating movement. Probably a ‘quick one’ from Dan Kitchener, but a real gem nonetheless. This is a really unusual piece by Aspire in a rather unusual setting. The nomadic community garden just off Brick Lane is an example of extreme Bohemian living. A collection of allotment huts, some of which are mini cafes, and a few small plots surrounded by graffiti and street art. It is a completely bonkers public space that has to be seen to be understood. I would normally associate birds and other wildlife with Aspire, so this rather ghoulish portrayal of Mother Teresa came as a bit of a surprise package. It is definitely by Aspire as it is signed with his characteristic signature in the colours used for the piece. My sister didn’t like this, and I tried to explain to her that it was not typical of his work. Personally I like to see artists switch it up from time to time. A fine piece. Well I think I hit door gold last week when taking a trip to London. My sister, who lives in Stoke Newington, and I had decided to spend the day together to remember our father on the first anniversary of his death. 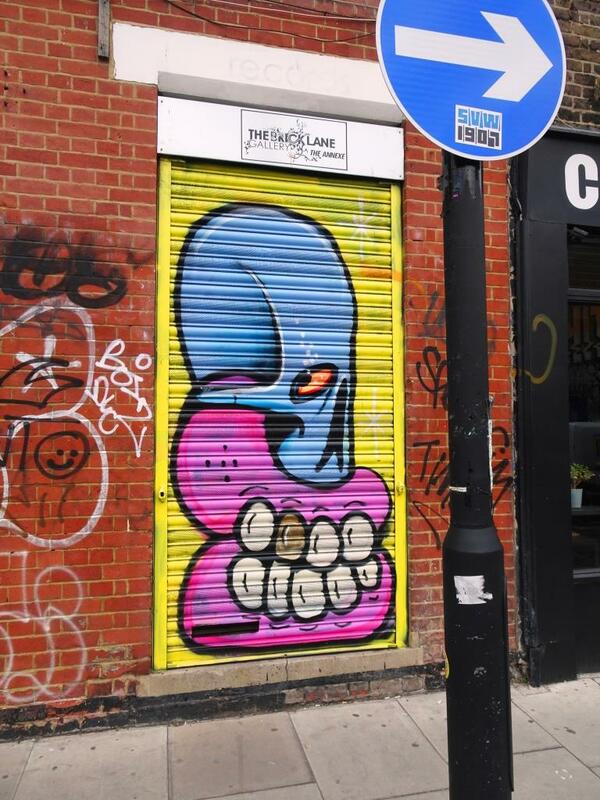 My sister suggested we take a walk in the Brick Lane area – I think she thought I’d enjoy showing her the street art in the area, and indeed she was right. Some of the pieces we saw are posted elsewhere on Natural Adventures. Heading back to a bust stop near Spitalfields Market, we turned right off Brick Lane and into Fournier Street. My jaw nearly hit the floor. I explained the whole ‘Thursday Doors’ to my long-suffering sister and proceeded to snap away. Fournier street is one of those amazing East End streets that has pretty much kept its character, and rather than being knocked down in some kind of ill-thought-out gentrification project it has survived and thrived in private ownership by people who took a punt back in the 1950s/60s that these houses were worth looking after. Gilbert and George are an example of that, and if you Google them in Fournier Street, you can see articles about their house (Number 8 I think). More Fournier door delight to come in Part 2 soon. For more doors and indeed the inspiration behind Thursday Doors go and take a look at Norm 2.0 blog where there are links to yet more doors. 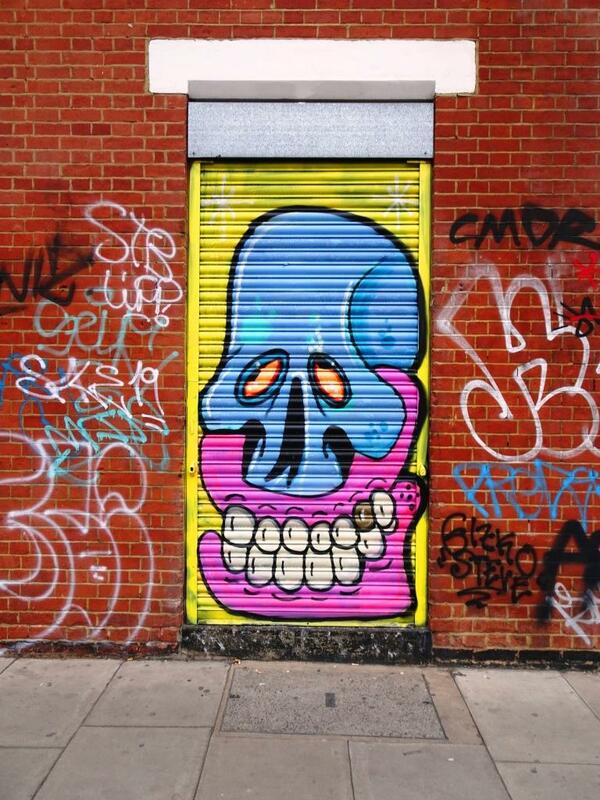 Sweet Toof is a London artist who has always had strong links with Bristol especially through his long-standing friendship with Rowdy. 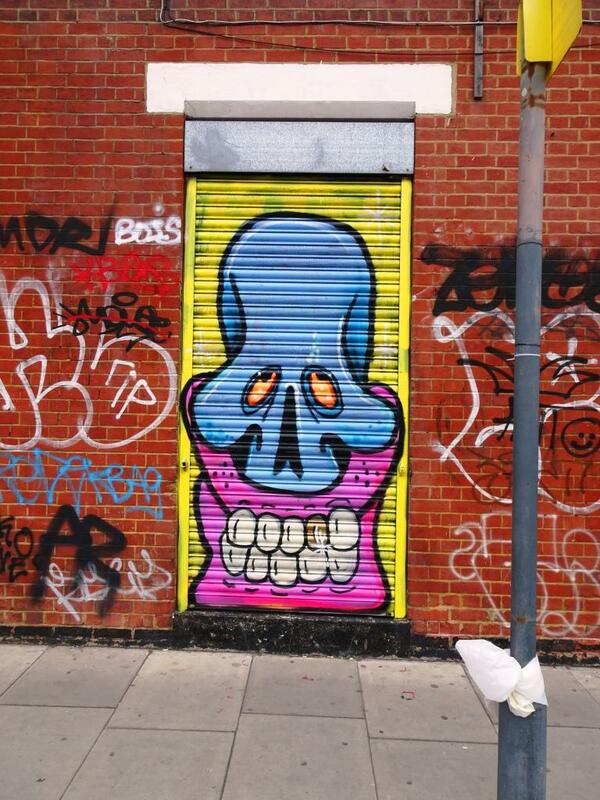 Even now, there are several toothy pieces dotted around the city. It is funny, but I have always thought of him as a Bristol artist, because of his legacy here. It was extra special to find this triptych of shutters, that look rather recent, when in London last weekend walking in the Brick Lane area with my sister. It doesn’t seem to matter where I pitch up in the world, there always seems to be a Sweet Toof piece close by. These three are really rather special, and have a feel of ‘see no evil, speak no evil, hear no evil’ about them. It is nice to see the three different aspects of the skulls. Obviously that Master’s degree from the Royal Academy of Arts was not wasted. I do like Sweet Toof’s work very much indeed, always blending mortality with humour in his incredibly distinctive style. Great find.